If you plan to cut a number of joints, it is well worth setting up a machine tool to make your production easier and faster. 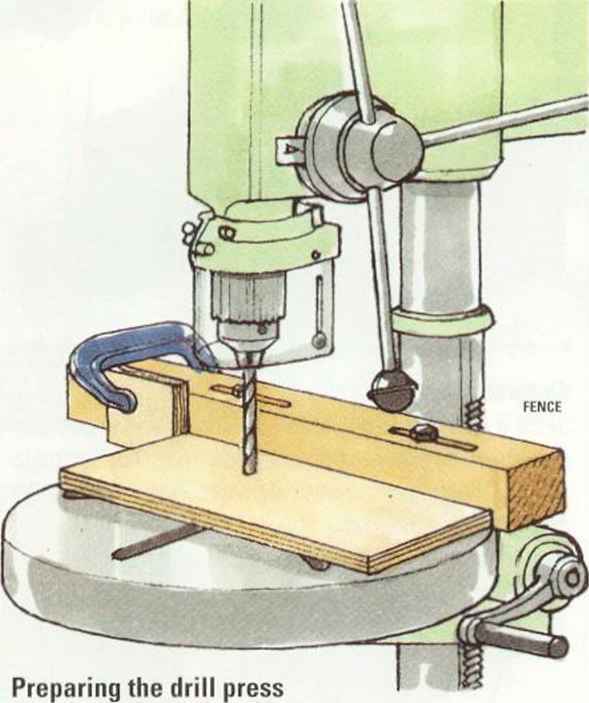 A drill press (or a power drill in a bench stand) can be used to remove most of the waste before finishing the job by hand, or - better still - you can fit a special mortising attachment to the drill press. 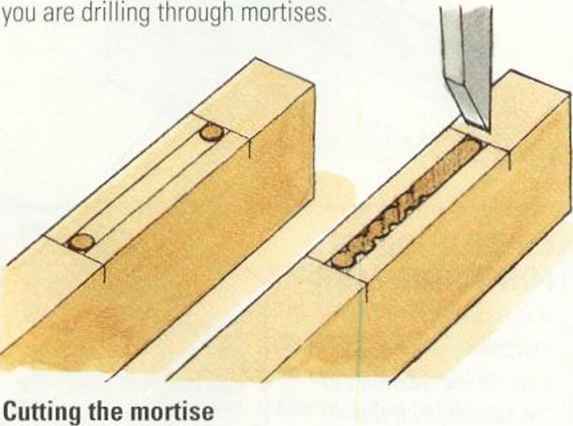 Drill a hole at each end of the mortise, then connect them with a row of slightly overlapping holes. Pare the sides and ends square with chisels. 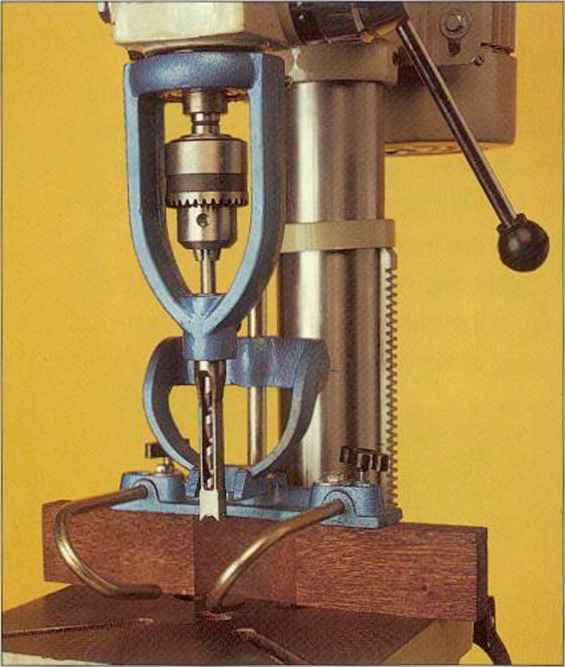 Adapt a drill press by fitting a mortising attachment, comprising an auger drill that removes the waste, coupled with a square hollow chisel which shapes the mortise at the same time. Remove the waste between the holes in stages. Work steadily at an even pace, to avoid any overheating of the auger bit. 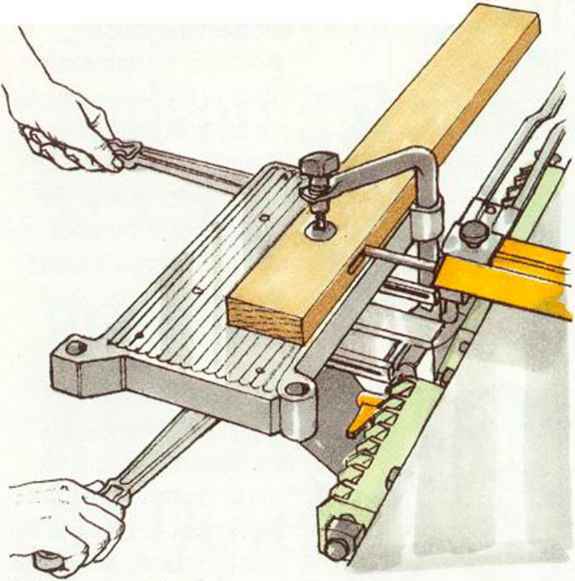 With all the workpieces cut to size, clamp a block of wood at each end of the fence to limit the movement of a workpiece to the length of the required mortise. 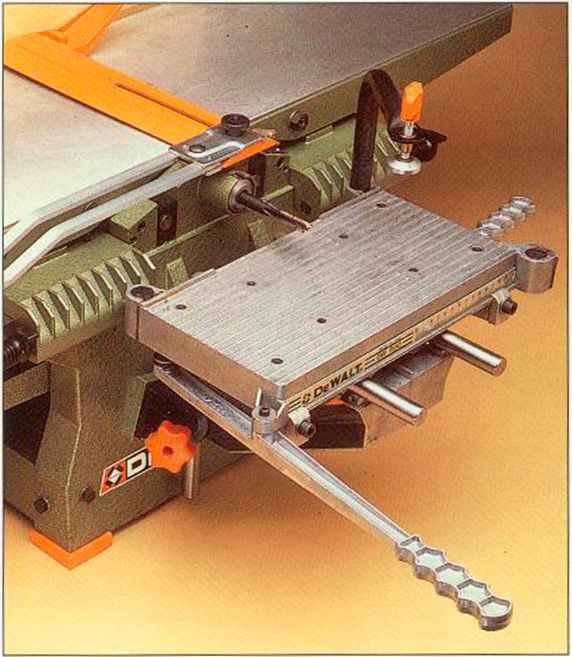 It is possible to adapt a planer-thicknesser to machine mortises by fitting a milling chuck to the end of the tool's cutter block. The workpiece is moved relative to the stationary cutter by means of a special mortising table that is adjustable in height. 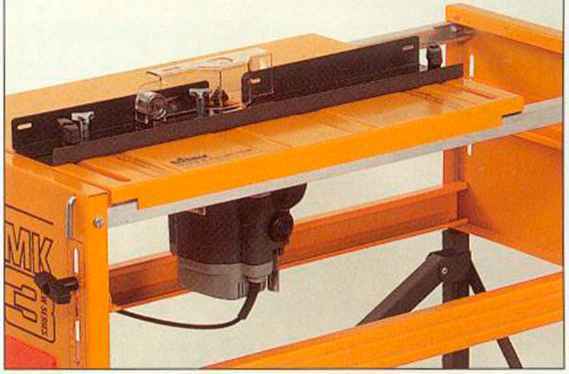 When using this type of attachment, it is imperative to cover the planer cutters with the appropriate guard. 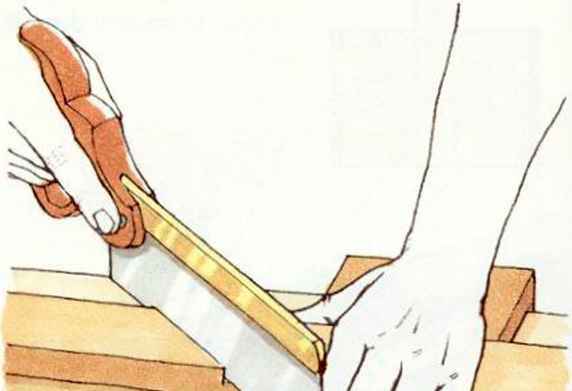 Avoid the risk of breaking the cutter by machining a mortise in stages, and never plunge deeper than the cutter's diameter during any one pass. Since the machined mortise has rounded ends, either chop them square with a chisel or file the corners off the tenon. Although you can cut mortises with a hand-held router, it is much more convenient to machine them with the tool inverted in a router table or workcentre. Once you have made the initial adjustments, you can cut any number of identical mortises without having to mark out the workpieces. With the work butted against the rear end stop, hold the wood firmly against the fence and lower it slowly onto the rotating cutter. 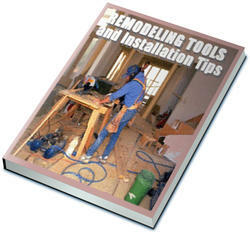 Feed the wood forward until it comes to rest against the other end stop, then carefully lift it clear of the cutter. Cut a deep mortise in stages, raising the cutter between each pass. 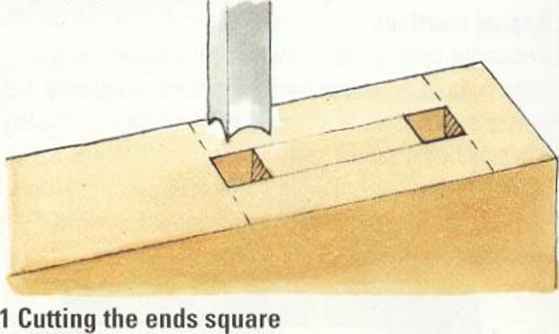 How to Drill a Square Hole.? 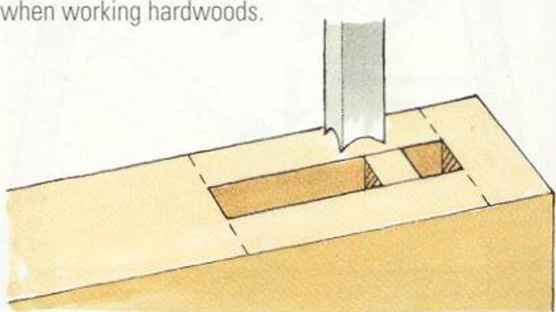 How to cut a square hole in wood using a chisel? How to cut a square slot in wood?